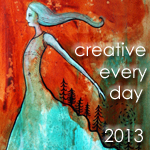 Welcome back to this month’s Creative Every Day challenge! You can find the March post here. This month’s theme was color. Now you would think that would be easy for me since I paint with color!! Not so much. The theme was too wide open for me. I like specifics. Like use blue and red together, or all the colors in a peacock feather…specifics like that! When a project came up in my painting class to work from a live model, I decided that I would try to use color to paint skin tones. I have taken many figure drawing classes over the years but I have never had the opportunity to paint from a live model. When you are drawing, you tend to focus mostly on lights and darks. When you are painting skin, there are so many colors to see. Warm hues in the highlights; cool hues in the shadows. Once I had the color palette in place for the model’s skin tones, I started playing around with some patterns for the backgrounds. Drips and swirls all combined together to create a kind of watery, mossy environment. The final addition was to have the model’s chair become a part of the patterned environment. I was really happy with my first attempt at figure painting and hope I can find the opportunity to try it again! 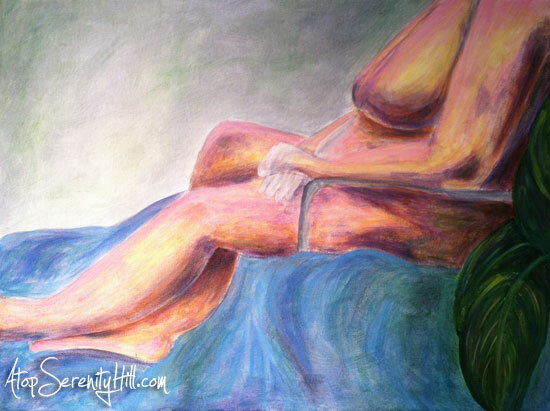 So I need your help….What title should the painting have?! Well, it would be better than the one my dad suggested!! Lol! Wow this is lovely! Maybe something about rest or refreshment? Thanks, Beth! Good suggestions! I am terrible with coming up with names for paintings. Many end up “Untitled”! !